Brain anatomy. Artwork of a coronal section through a human brain, showing the ventricles and other structures. At top is the medial longitudinal fissure, the cleft that separates the two hemispheres of the brain. Most of the grey and white tissue seen here is part of the cerebrum, the folded outer region of the brain. 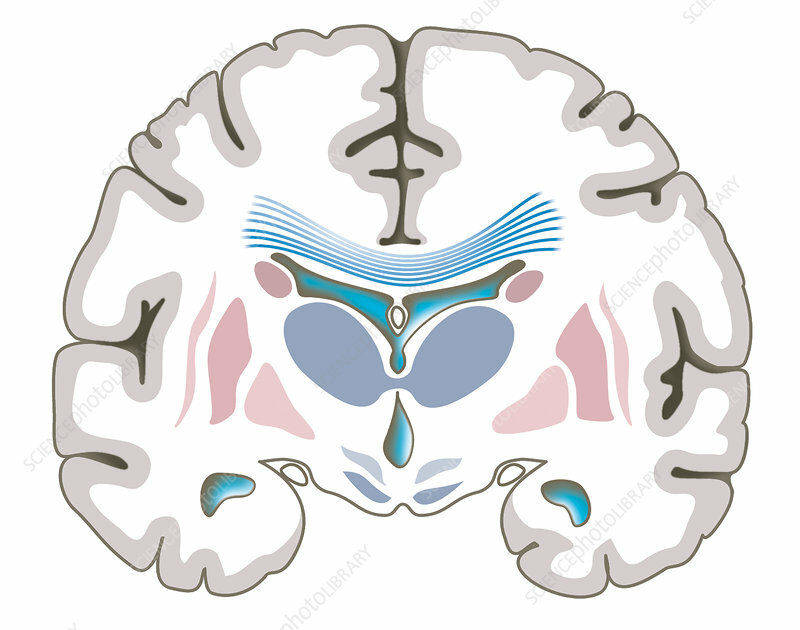 At centre, deep in the brain, the double-lobed structure (grey-blue) is the thalamus. The green-blue regions are parts of the ventricles seen in cross-section, with the horns of the lateral ventricle at lower right and left. The bands (blue) at upper centre are part of the corpus callosum. The pink areas are basal ganglia.